This Gothic Revival church was designed by 23-year-old Edwin Welby Pugin (son of ‘A.W.’ - Augustus) as a parish church, that is to say it was never intended that it be used as the mother church of a diocese. It was built during the 1850’s to replace a small Catholic chapel in nearby King Street, now the site of the bus terminus. It was completed in 1857. 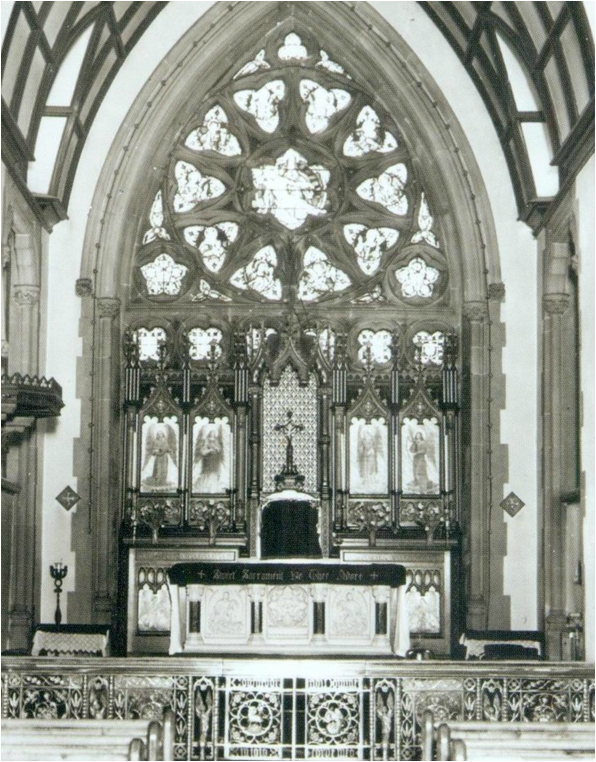 The church was commissioned by Richard Thompson (1799-1866) who, with his father and uncle, had developed the local coal and iron industries in the 19th century. In the cloister is a tomb with an effigy of Ellen Thompson, Richard’s wife, who died of cholera in 1852. Designed in the Gothic style attributable to the 13th Century, known as Early Decorated or Geometric, the style is characterised by the use of circles as the basis for its window tracery and by the sturdy columns topped with capitals carved with slightly stylised plants and animals. Menevia had been erected as a diocese in 1898 by Pope Leo XIII and the church was chosen as the Episcopal seat. It was consecrated a pro-cathedral for the original Diocese of Menevia on the 7th November 1907, fifty years after its completion. In 1987, Menevia was spilt by a decree of Saint John Paul II and the smaller Diocese of Wrexham was created. Wrexham takes in the North of Wales (Flintshire, Conwy, Gwynedd, Denbighshire, Anglesey and the northern part of Powys). Significant alterations and additions were made to the church in 1957 and then again in 1966.